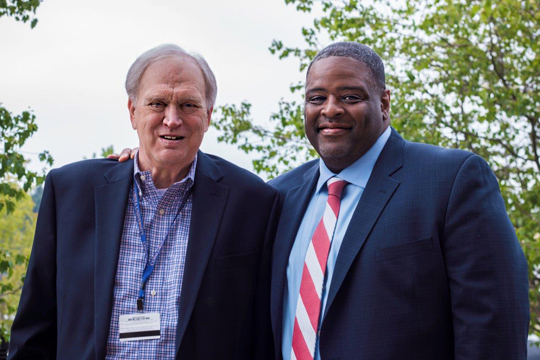 Dr. Elliot Moeser, CUW faculty member and executive director of the Closing the Achievement Gap Consortium (CAGC) poses with Dr. Demond Means, outgoing superintendent of the Mequon-Thiensville School. 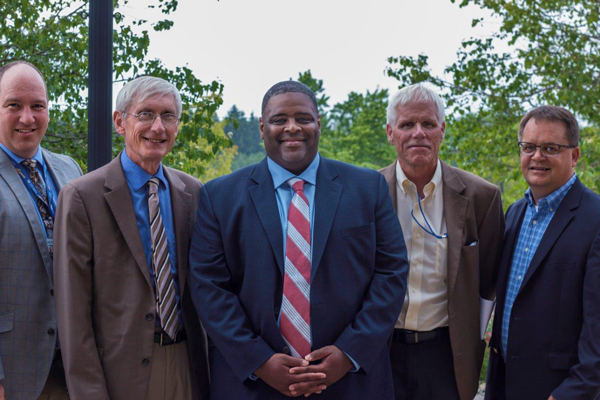 Concordia University Wisconsin’s School of Education honored the outgoing superintendent of Mequon-Thiensville schools yesterday for his ongoing partnership with Concordia, specifically its efforts to support marginalized and low-achieving students. Dr. Demond Means, who received his bachelor’s degree from Concordia in 1994, announced last month that he accepted a position as the superintendent of the Clarke County School District in Athens, Georgia. He will be making the move to the south later this month. In addition to serving on Concordia’s Board of Regents from 2005 to 2011, Means has remained involved with Concordia in a variety of ways including serving as chair of the Closing the Achievement Gap Consortium, which he co-founded and for which Concordia faculty member Dr. Elliot Moeser serves as executive director. Started in 2012, the CAGC seeks to embrace and change school practices, instructional methodologies and structures in schools in the Greater Milwaukee area – where the nation’s highest instances of achievement gaps occur – in order to address the radically disproportionate academic achievement among diverse student groups, especially for students of color. The consortium is made up of 26 public, private, charter and parochial schools and school systems. Also in attendance at the Thursday meeting were more than two dozen administrators from participating CAGC schools. Prior to the awards presentation, the group discussed several initiatives that have occurred or are occurring this summer. The efforts include multiple Equity Institutes, which are hosted at various participating CAGC schools and offer training and professional development on how to offer equitable learning opportunities to all students. Additionally, the CAGC will host a new teacher orientation on a similar theme to be held at Concordia in August. Last year’s orientation for new teachers drew 400 instructors. One of the most notable efforts of the CAGC is its annual African American Male Initiative (AAMI), a summertime initiative that encourages young men of color to succeed academically with the intent of pursuing higher education. During the four-day event, students stay overnight in the CUW dorms and participate in learning and career development opportunities. Last year’s AAMI event drew 94 youth, up 57 from the previous year’s inaugural effort. Moeser says he expects to have 180 youth attend this year’s event in July. Means, who had worked under Moeser in the late ’90s as vice principal in the Nicolet School District, is an irreplaceable part of CAGC and its efforts, according to Moeser.